↑ Lori Martinez (1996). 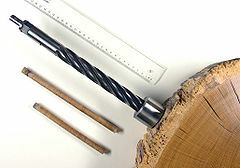 ""Useful Tree Species for Tree-Ring Dating"". สืบค้นเมื่อ 2008-11-08. ↑ Ferguson CW, Graybill DA (1983). "Dendrochronology of Bristlecone Pine: A Progress Report". Radiocarbon. 25: 287–288. ↑ Renfrew Colin, Bahn Paul (2004). Archaeology: Theories, Methods and Practice (Fourth ed.). London: Thames & Hudson. pp. 144–145. ISBN 0-500-28441-5. ↑ "Bibliography of Dendrochronology". Switzerland: ETH Forest Snow and Landscape Research. สืบค้นเมื่อ 2007-05-15. ↑ Baillie Mike (1997). A Slice Through Time. London: Batsford. p. 124. ISBN 978-0713476545. หน้านี้แก้ไขล่าสุดเมื่อวันที่ 18 พฤศจิกายน 2557 เวลา 19:25 น.